Outsourcing is presented as a very important tool for reducing cost and improving quality, but evidence is not strong. If an organization does one or all its work by itself, its work may affect its production quality. So, an organization must recognize some important areas where it can reduce its costs and maintain high quality in its products and/or services. A public–private partnership (PPP) is a government service or private business venture which is funded and operated through a partnership of government and one or more private sector companies. PPP refers to forms of cooperation between public authorities and the world of business, which aim to ensure the funding, construction, renovation, management or maintenance of an infrastructure or the provision of a service. A main characteristic of PPP is the relatively long duration of the relationship. PPP involves a contract between a public sector authority and a private party, in which the private party provides a public service or project and assumes substantial financial, technical and operational risk in the project. In some types of PPP, the cost of using the service is borne exclusively by the users of the service and not by the taxpayer. (3) In other types (notably the private finance initiative), capital investment is made by the private sector on the basis of a contract with government to provide agreed services and the cost of providing the service is borne wholly or in part by the government. In projects that are aimed at creating public goods like in the infrastructure sector, the government may provide a capital subsidy in the form of a one-time grant, so as to make it more attractive to the private investors. In some other cases, the government may support the project by providing revenue subsidies, including tax breaks or by removing guaranteed annual revenues for a fixed time period. There are usually two fundamental drivers for PPPs. Firstly, PPPs are claimed to enable the public sector to harness the expertise and efficiencies that the private sector can bring to the delivery of certain facilities and services traditionally procured and delivered by the public sector. Secondly, a PPP is structured so that the public sector body seeking to make a capital investment does not incur any borrowing. Rather, the PPP borrowing is incurred by the private sector vehicle implementing the project. On PPP projects where the cost of using the service is intended to be borne exclusively by the end user, the PPP is, from the public sector’s perspective, an “off-balance sheet” method of financing the delivery of new or refurbished public sector assets. On PPP projects where the public sector intends to compensate the private sector through availability payments once the facility is established or renewed, the financing is, from the public sector’s perspective, “on-balance sheet”; however, the public sector will regularly benefit from significantly deferred cash flows. In health more common is using the terminology of PPP. 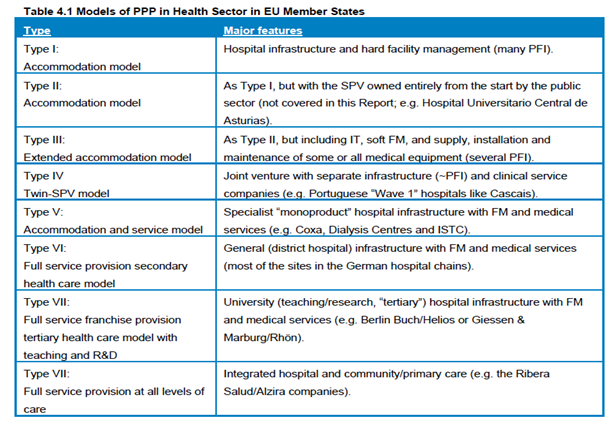 Full-service PPPs (infrastructure and clinical) should be subject to the same rules on patient access and tariff and inadmissibility of out of pocket payments as hospitals controlled by other public, private or social sectors sponsors, so that the patient experience should not differ significantly. Accommodation-only should be used only in special cases: when the public sector needs to construct infrastructure but has no money for investment in the current budget yet is able to make annual payments in the future. The evidence shows that ownership is not a major determinant of efficiency in service provision. An appropriate structure of incentives for providers, including the financing mechanisms, together with competent management and follow up are more important determinants of outcome and cost-effectiveness. PPP in health have been a response to a specific problem or policy situation. A common shortfall of all projects is that no formal evaluation of the outcome has been planned into the project. Since health care increasingly focuses on patient outcome and cost-effectiveness, PPPs including health care delivery must be evaluated using the data from clinical practice. The use of Structural Funds would be justified only after having obtained evidence of the comparative advantages of current PPP-long term concessions. In general there are two main reasons for the use of PPPs: to accelerate infrastructures and to reduce costs. To accelerate infrastructures. The novelty of PPPs is in the concession model, which was initially designed to build infrastructures (PFI) with long-term contracts, entails an obligation of periodic payments (including annual increases, for a long period of time). This model is more rigid than the traditional forms of private partnership in a healthcare delivery system. In the long term it could also be more expensive for public finances. The concession PFI-formula originated from the need for some public health services to obtain private financing to accelerate the construction of new hospitals or residences. Its economic context was growth and expansion. Health services then had a budget sufficient to meet the new commitments of annual expenditure of the concession. Jamieson, Dave, “Public Interest Group Challenges Privatization Of Local, State Government Services”, The Huffington Post, July 1, 2013. Hira, Ron, and Anil Hira. Outsourcing America: What’s behind Our National Crisis and How We Can Reclaim American Jobs? New York: AMACOM, 2008.